As if there weren’t already enough ways to control all of your smarthome devices, text messaging could be the most convenient method for some users. Here’s how to make it work using IFTTT and some hashtags. Some people spend more time in the Messages app than any other app. Thus, you probably have your phone set up in such a way that you can quickly and easily send a text message whenever you need to. This alone can make controlling certain smarthome devices a lot easier. Furthermore, Apple users have an even better advantage when it comes to controlling smarthome devices with text messaging. With iMessage, you can send and receive text messages right from your Mac. 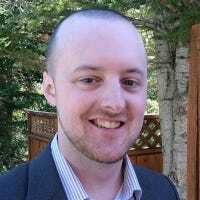 So when you’re working on your computer, you can quickly pop open iMessage and shoot a quick text message to anyone, which is even quicker and easier than picking up your phone. You can do this with Android as well with a third-party tool. With that said, I’ve found text messaging one of the quickest and easiest methods for controlling some of my smarthome devices. Granted, voice control with Alexa or Google Assistant is right up there as well, but if I’m not able to shout at Alexa, text messaging is king—and it works no matter where I am. To make this work, we’ll be using IFTTT and its SMS service in order to control our smarthome devices. If you’re not familiar with IFTTT, check out our full guide on how to set it up and create applets. For our example, we’ll be setting up an applet to turn on and off the television using the Logitech Harmony Hub—but this will work with your Philips Hue lights, your Nest thermostat, or any other smarthome devices that work with IFTTT. To get started, visit the IFTTT website and click on “My Applets” toward the upper-right corner of the screen. Next, click on “New Applet”. Type “SMS” in the search box or find it in the grid of products and services below. Click on it when you find it. Next, click on “Send IFTTT an SMS tagged”. Type in the hashtag that you will send in the text message. In this case, I’m using “tvon” to turn the TV on. This means that I will need to type in “#tvon” and send it to IFTTT in a text message. Click on “Create Trigger” when you’re done with this step. Find the smarthome device you want to control—in our case, type “Harmony” in the search box or find it in the grid of products and services. Click on it when you find it. 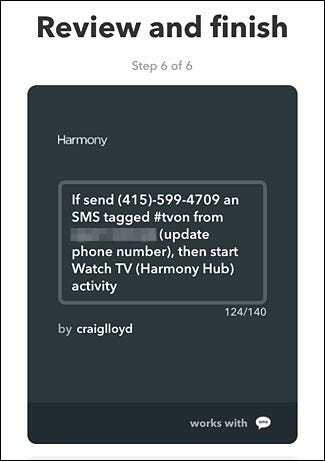 You may need to connect it to your Harmony account to IFTTT if it isn’t already connected. After that, click on “Start Activity”. Select your activity from the dropdown menu. In this case, I only have one and it’s already selected. Click on “Create Action” when you’ve selected an activity. On the next screen, give the applet a name (the default name is kind of a mess). Here you’ll also see the phone number that you’ll send the text message to. Below that, select whether or not you want to receive a notification every time this applet is used. Click on the big blue “Finish” button to finalize and create the applet. From there, the applet is officially live and you can start using it right away. The big toggle switch in the middle allows you to temporarily disable and enable the applet at any time. 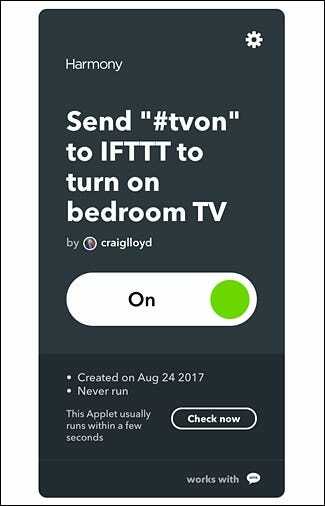 I use this specific applet all the time to turn off our bedroom TV, because my wife likes to fall asleep with the TV on. So shouting at Alexa isn’t the best option here, and sending a quick text from my computer or phone is a lot easier than finding the Harmony app or fumbling for the remotes.